The Vanderbilt Cup Race episode will be repeated throughtout the spring and summer. 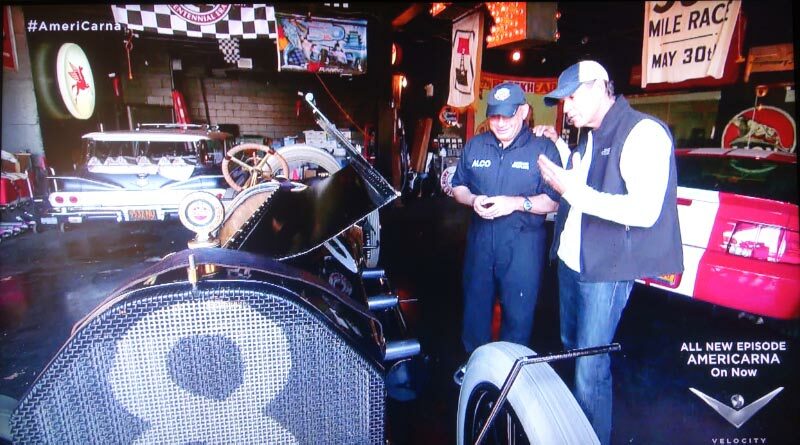 On Long Island, repeats of the Velocity Channel's AmeriCarna series can be seen on Cablevision's #27 and #727 (HD Channel), DISH Network #246, FIOS (631 HD) and Direct TV #281. Here is a "behind the scenes" account of the making of this program. 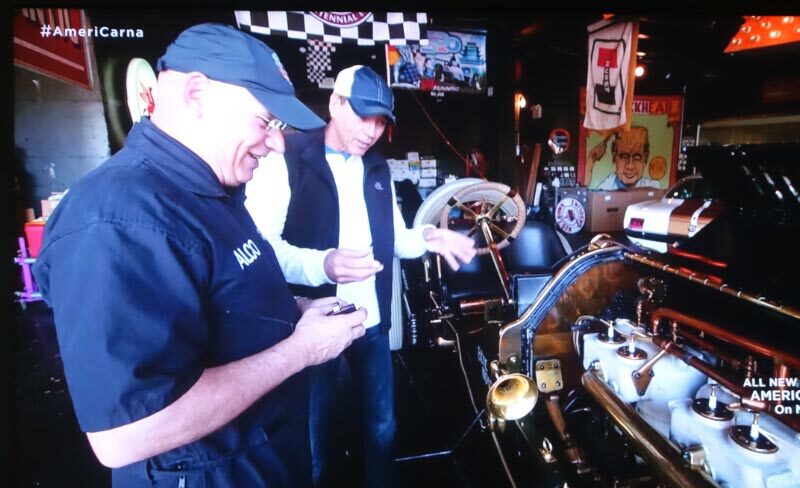 This 10-part series on Discovery’s Velocity channel features racing icon Ray Evernham (left) “chasing down cars that had a profound impact on shaping our national identity.” Evernham is considered one of the greatest crew chiefs of all time with 47 wins and three championships with Jeff Gordon. 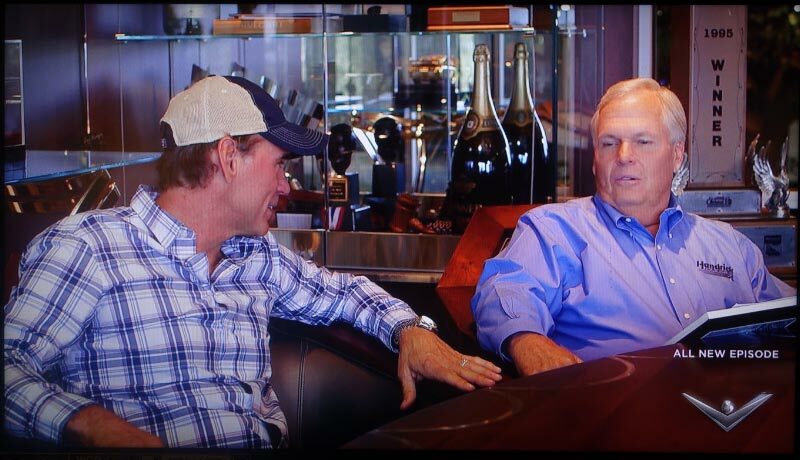 He is co-owner of the AmeriCarna series with Rick Hendrick, owner of Hendrick Motorsports (right). Among the featured AmeriCarna guests in its first year were Ron Howard, Mike Love and Brad Paisley. The series has been renewed for a second season. 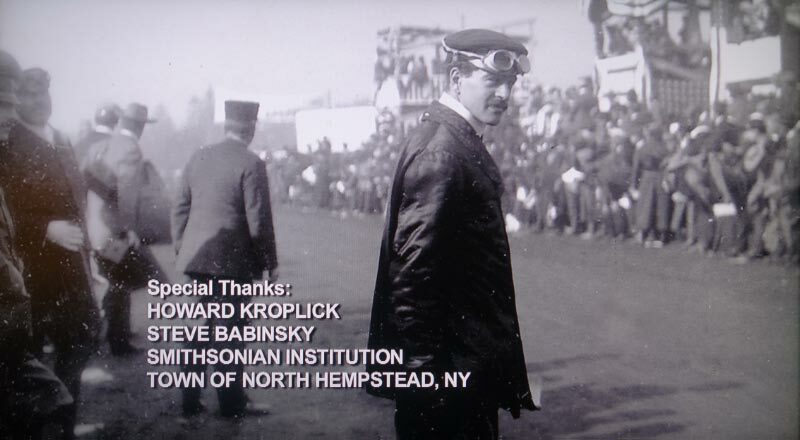 When and where was the Vanderbilt Cup Race episode filmed? 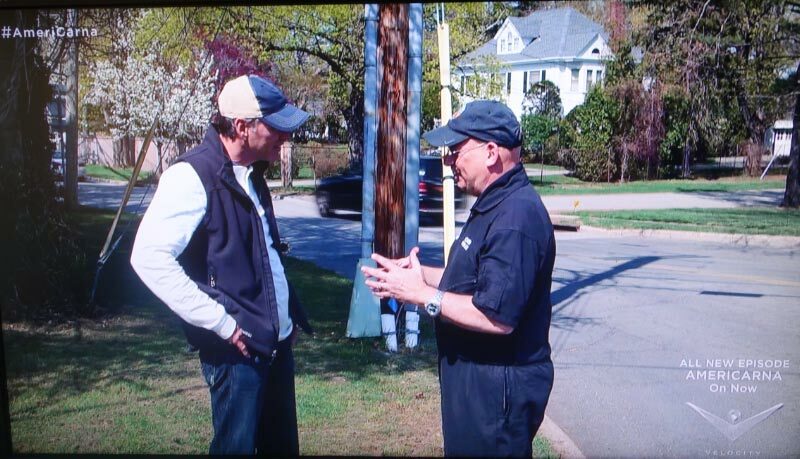 The episode was filmed on April 27-28, 2013 in Roslyn, Huntington, Westbury, Old Westbury and Lebanon, New Jersey. Ray was surprised at the size of the 680 cubic inch 6-cyclinder engine. 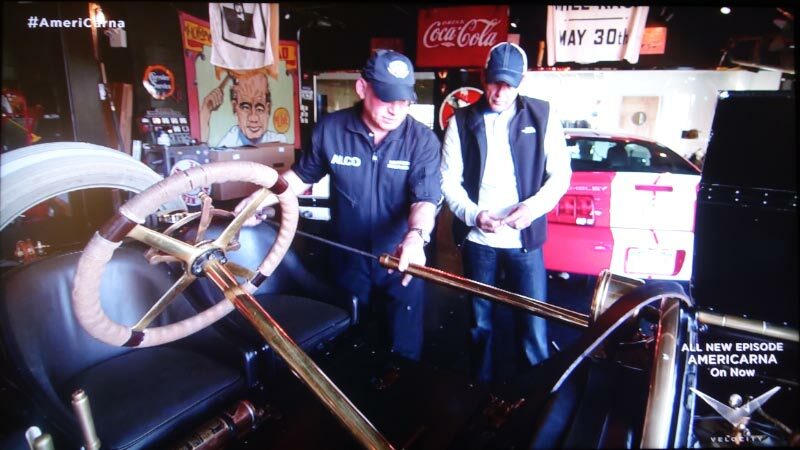 Showing Ray the manual fuel pump. Ray was a wonderful, friendly interviewer . We had a lot of fun, which I believe showed up in the filming. Ray gave a big smile when we joked that the mechanician was the most important person on the racing team…just like a crew chief. Where did the Black Beast go for a ride? I took Ray for a two-mile trip through the historic Village of Roslyn. Which historic Vanderbilt Cup Race locations did we visit? Ray and I visited three historic Vanderbilt Cup Race course locations; the 1906 Hairpin Turn in Old Westbury (left), the 1904 and 1906 grandstand location in Westbury and the 1908 Ellison Road railroad bridge in Westbury. 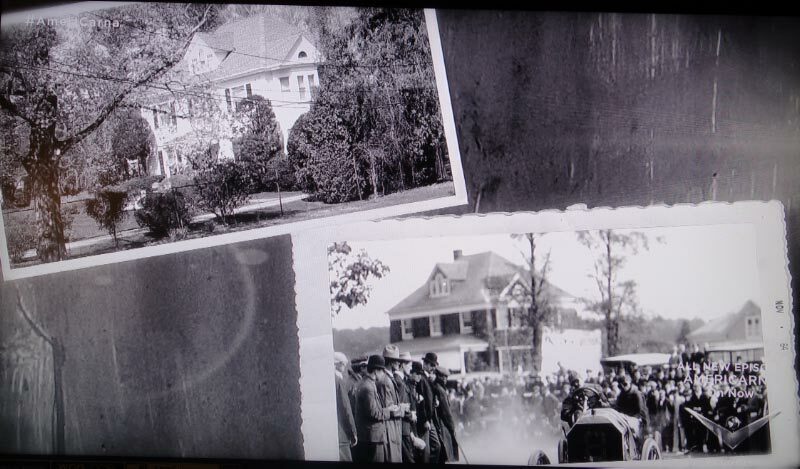 The house at the Hairpin Turn in Old Westbury remains basically unchanged since 1906. 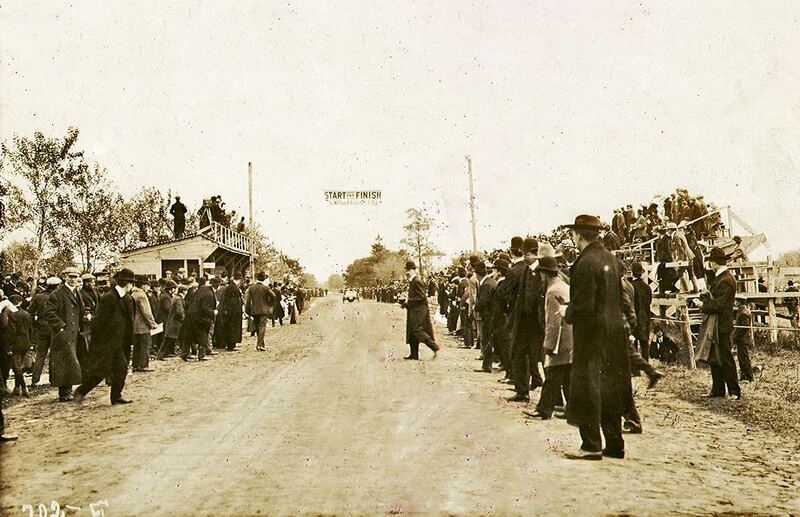 Next stop was the “sacred ground” of the Start/Finish line and grandstands for the 1904 and 1906 Vanderbilt Cup Races. The same view as seen in 1904. 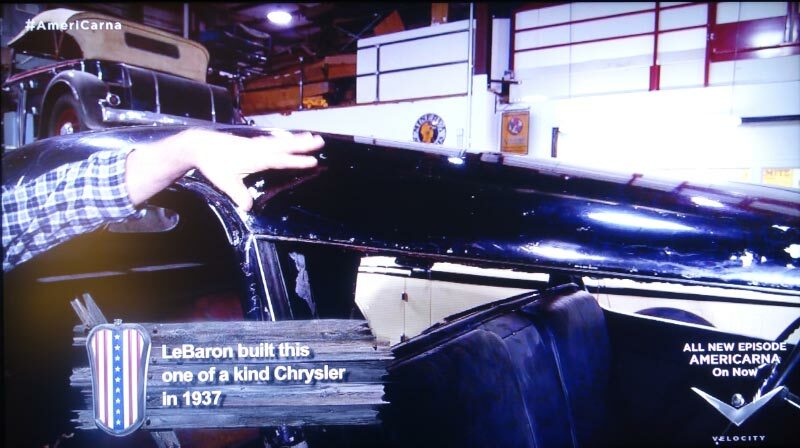 Why did Ray decide to visit Chrysler’s Chrysler? 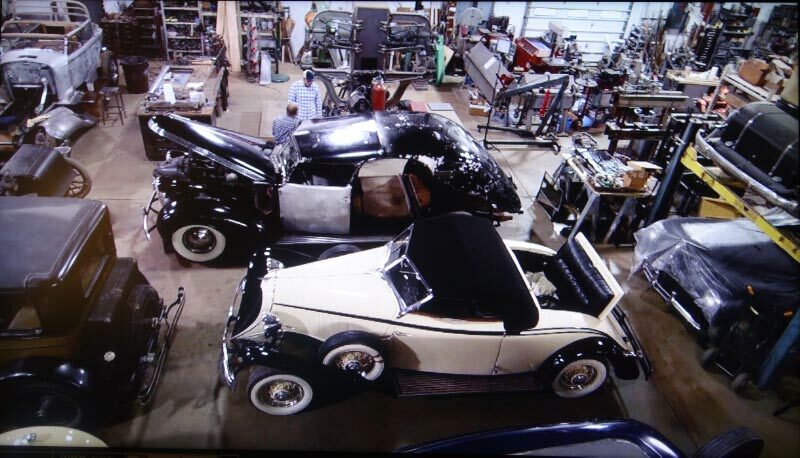 Ray Evernham was fascinated that I was restoring Walter P. Chrysler’s 1937 C-15 TownCar. Chrysler had once worked as a plant manager for an Alco locomotive factory. 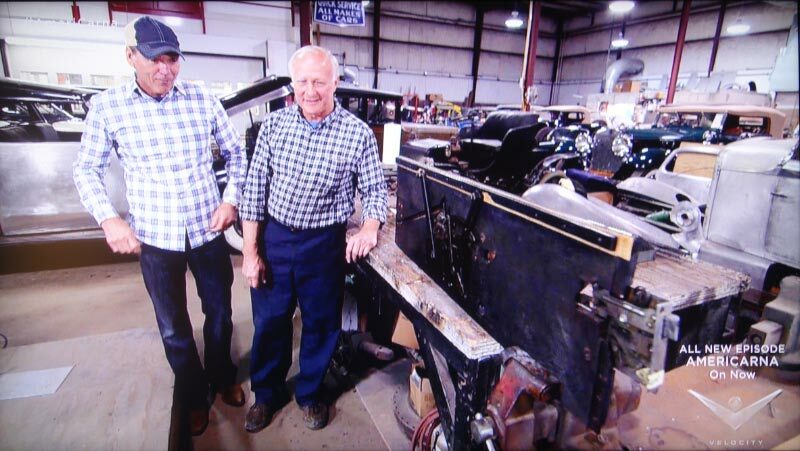 After spending a day with me, Ray visited Steve Babinsky’s Automotive Restorations facility in Lebanon, New Jersey. The Chrysler can be seen in the middle of the photo, taken almost one year ago. Steve is showing Ray the unique spring loaded automatic window and door locking system of the car. How did Ray get to see the Vanderbilt Cup Trophy? Persistence! After weeks of trying, they received a go ahead. 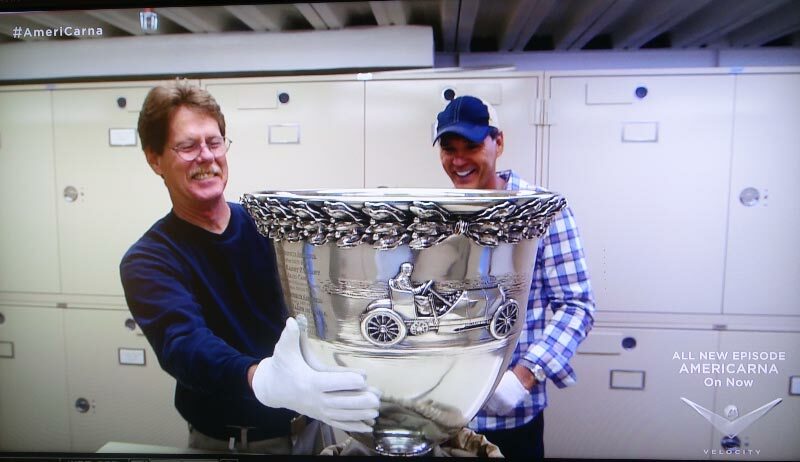 I really enjoyed watching Ray’s excitement on finally tracking down the Vanderbilt Cup trophy. 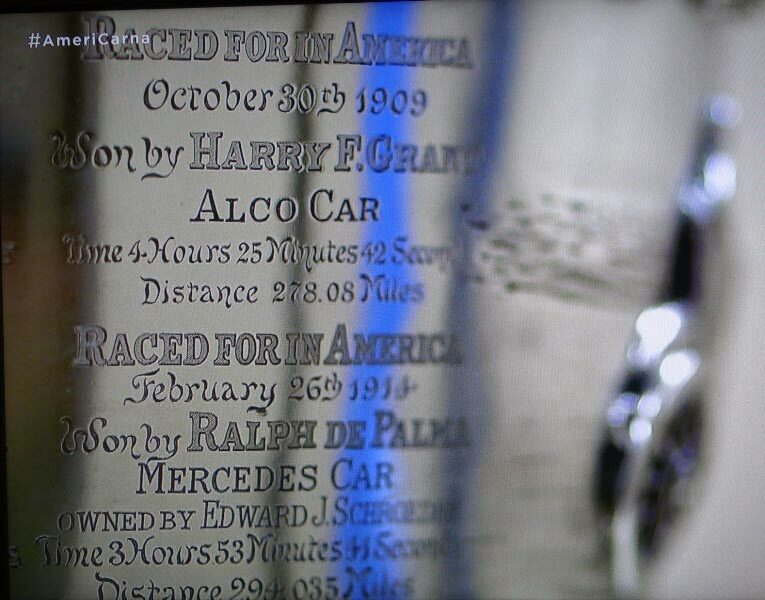 Another highlight was seeing the Harry Grant and the Alco on the trophy. 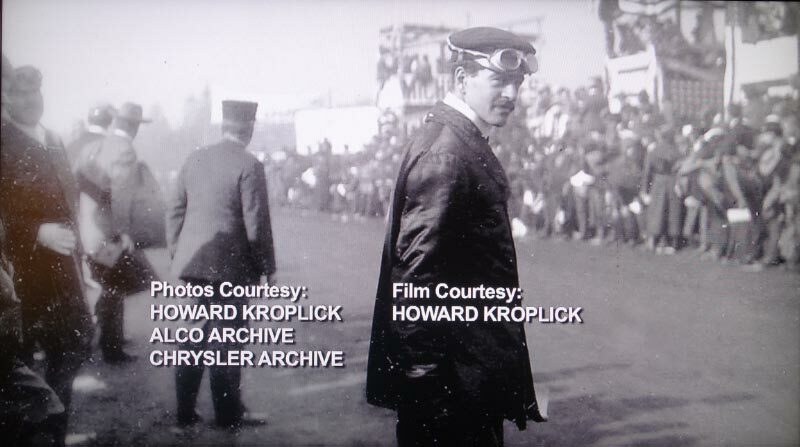 It was wonderful to see the closing credits with one of my favorite photos in the background of Willie K. at the 1905 Vanderbilt Cup Race. 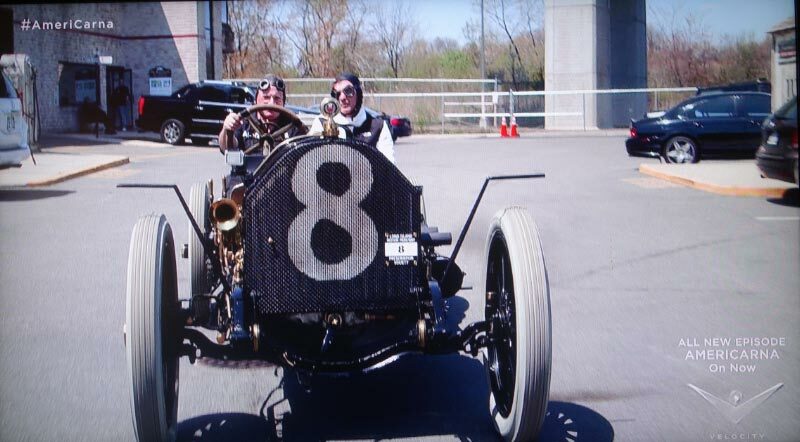 A really wonderful show and presentation, with a great perspective on the history of the Vanderbilt Cup races and how they were a major impact on car racing in the USA as well as the development of the automobile. Very well edited, with a lot of period images (thank you Howard!) This show doesn’t have the hype/focus of the majority of the other car shows on Velocity - find cars, talk the owners out of the, resell them for a big $. 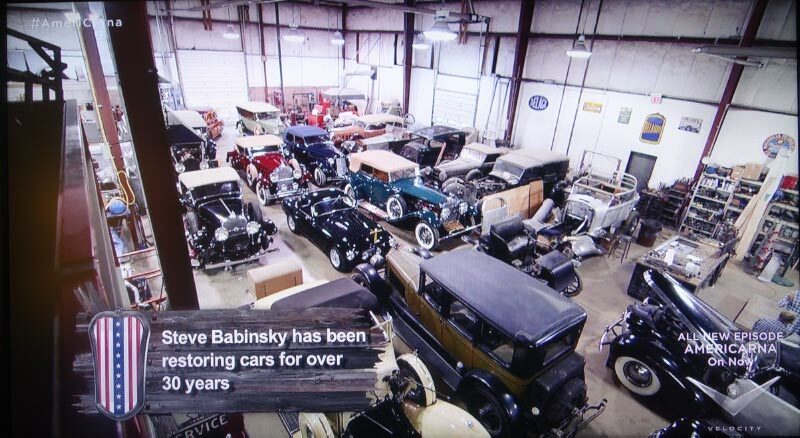 What a refreshing change to view a show about cars that focus on their history not the current value $ wise. Thoroughly enjoyed the Americarna presentation. Excellent work by the team of Howard and Ray! 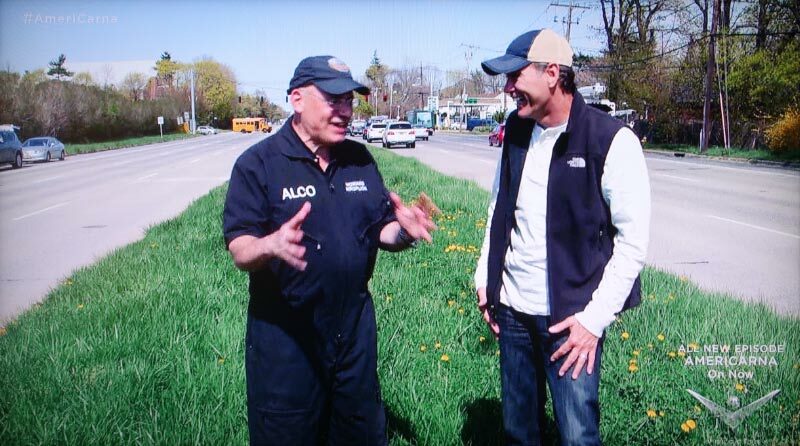 How did Ray learn about the ALCO? What prompted him & his producers to make the episode? How many video cameras, technicians? Did they offer to pay you anything? The video clips are good. You are terrific. I called Paul Bergman to watch yesterday. Paul’s Father Sig and my Dad Sonny were huge fans of Phil Kroplick. You have brought the Vanderbilt Cup and The L I Motor Parkway to the nation again. 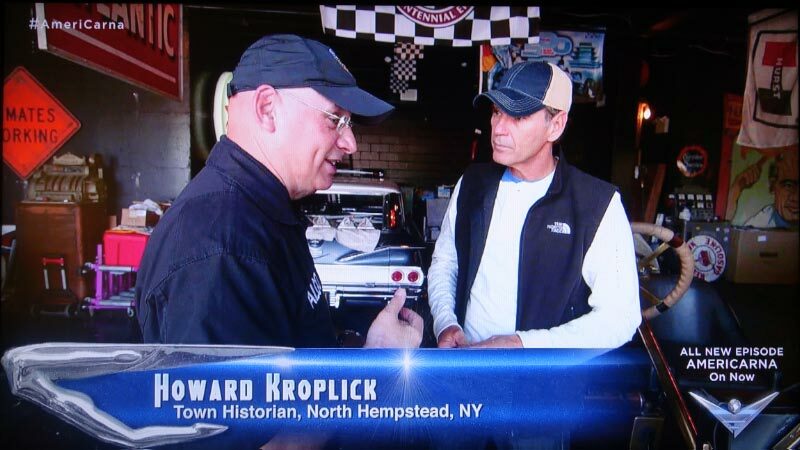 I enjoy speaking with people in California, say at Pebble Beach, who all seem to know about the early Long Island races and the Motor Parkway, with a great deal of this information resulting from your work and from shows like this starring the Black Beast as a vehicle to help show the Motor Parkway and early racing on Long Island. Jan, the producers found out about the Vanderbilt Cup Races and the Alco from this website. 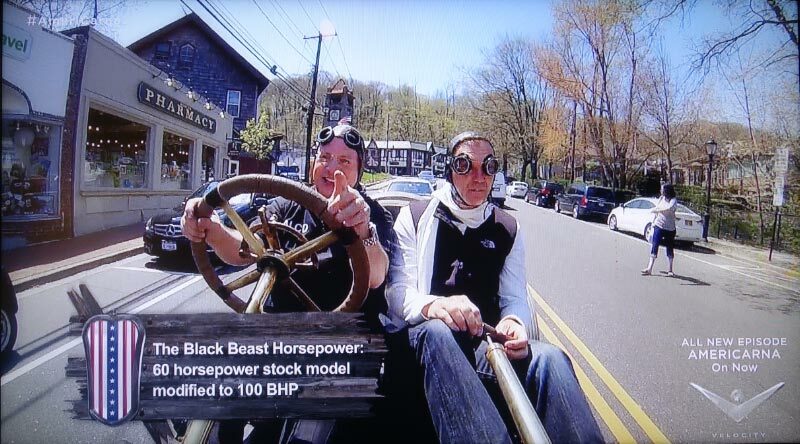 There were two cameras for the shoot and two Go-Pros on the Black Beast. The AmeriCarna staff were two cameramen, one sound person, a director, a production manager and Ray. Child Abuse Prevention Services (CAPS) received a donation for my participation in this program. Bruce, note the Long Island Motor Parkway Preservation Society plate on the front of the Black Beast. Thanks all for the positive feedback. Much appreciated! I caught the show on Velocity last night and it was fantastic! You did a great job giving them just what they needed to make a fine TV show while bringing attention to the Vanderbilt Cup Races. Bravo!! Are there any future showings of this episode? No TIVO slot the first time, just heard about the recent showing after being away. The episode was AWESOME! I really enjoyed it. Thank you Howard for the web site and for offering the Black Beast for us to see (and hear!) through out the year. Who else does that with a 1 of 1 race car! 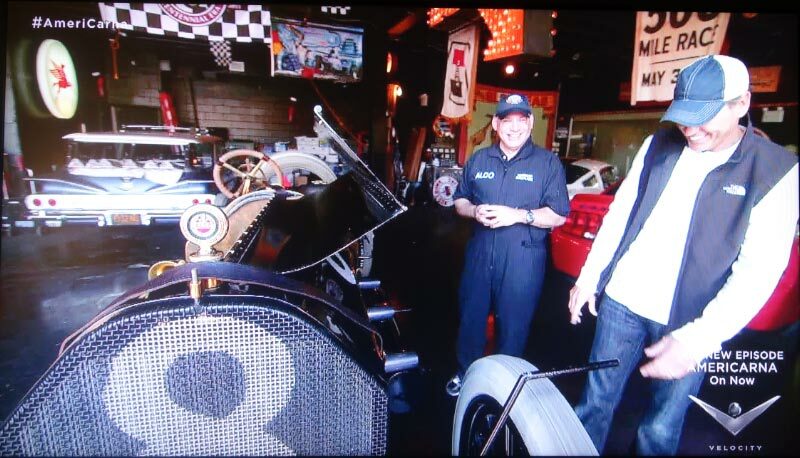 I just watched you in the AmeriCarna show - what a terrific job you did. It was fantastic!! I really enjoyed it. The checkered flag was a cool bit of info. Glad you talked about the Vanderbilt Cup races, that is a fantastic subject that I hope gets more light shed on it. Just watched the AmeriCarna episode. So great to see you on tv. You did an excellent job. 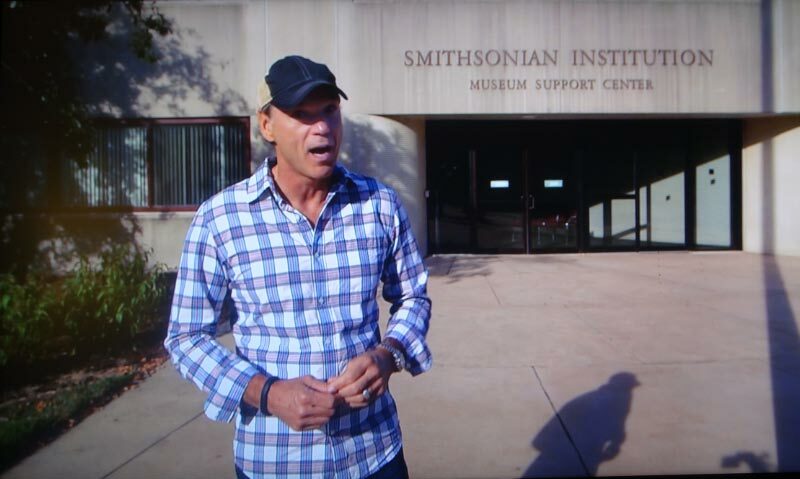 The Smithsonian should give you that trophy - it’s a shame to have it locked away and not displayed.